President & Chief Technology Officer – Reliance Capital Ltd.
Sandeep Phanasgaonkar is President & Chief Technology Officer for Reliance Capital Ltd. Sandeep is responsible for all IT initiatives at Reliance Capital. Reliance Capital is a diversified financial services company with presence in Mutual Funds, General Insurance, Life Insurance, Online Trading & Broking, Consumer and Mortgage Finance. Reliance Capital is among the top 3 private sector Indian companies in the financial services sector and has created a strong financial platform that will continue to be the bedrock for accelerated growth and profitability. Reliance Capital belongs to the Reliance ADAG which is the second largest business group in India. 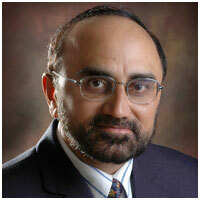 Sandeep has over 25 years of experience in applying IT solutions for finance, banking and BPO and IT-enabled services. He began his career with the State Bank of India and has worked subsequently with Tata Infotech, iFLEX Solutions and with Deutsche Bank as its Regional-Asia Technology Head. He joined Reliance Capital from Genpact (India’s largest BPO) where he was the Global Chief Information Officer. Sandeep led the critical IT Transition of Genpact from GE and was responsible for global IT delivery and driving operating efficiencies across India and the global locations of the company. Sandeep’s current role as CTO for Reliance Capital requires him to drive both Line-of-Business (LOB) specific initiatives and pan-Capital, strategic initiatives for the enterprise. This leverages synergy between different Line-of-Business functions, creating a differentiating value proposition for the company’s services and products and also a whole, new service and relationship proposition for the customer. He is focusing very keenly on driving productivity and giving a whole new meaning to the phrase “doing more with less”. Sandeep is an MBA from Jamnalal Bajaj Institute of Mgmt Studies, Mumbai.